Repetitive stress activity of the hand is the main cause for carpal tunnel syndrome. That is why it’s so vital to stretch the forearm and hand muscles, especially if you have a job that requires you to be on the computer for an extended period of time. Stretching the forearm and hand flexors regularly will help release these tight muscles that if not addressed can compress the median nerve, causing you pain, tingling and numbness in the hand, all of which are symptoms of carpal tunnel syndrome. You can help prevent strain and over-use injuries of the hand, wrist and forearm by stretching these muscles for a few seconds, several times a day. Here are two stretches that are quick and can easily be performed anywhere. Start with your arm that is being stretched straight in front of you with the elbow extended and palm facing up. Grip the forearm being stretched with the thumb of the non-stretch hand under the wrist and the four fingers on the palm. Slowly extend the wrist back until you feel a stretch through your forearm. Hold the stretch for 10-20 seconds and repeat three to five times for each forearm. 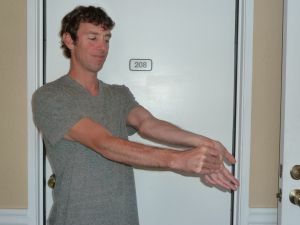 I recommend beginning with this stretch before stretching the hand flexors. 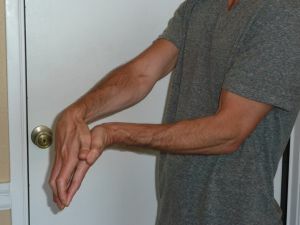 Releasing the forearm muscles first will free up more space along the carpal tunnel ligament that connects the wrist to the hand. This will allow for a deeper stretch through your hand flexors. Start with the hand being stretched palm up with your fingers extended. Place your non-stretch hand on top of the hand being stretched fingertip to fingertip. Slowly extend your fingers and thumb back by pressing the fingers and thumb from your non-stretch hand against the hand being stretched. Hold the stretch for 10-20 seconds and repeat three to five times for each hand. Don’t be surprised if one side is more flexible than the other. If this is the case notice if you are using that hand more exclusively during the day. If so try performing mindless tasks such as, holding eating utensils or brushing your teeth with your other hand. Its good for your body and brain!